Doris Marie Haley obituary. Carnes Funeral Home. Doris Marie Haley passed away on July 15, 2013 at the age of 83. She was our beloved Mother, Grandmother, Great, Grandmother and Great-Great Grandmother, Aunt, friend and neighbor. She was born in Nacogdoches, Texas on May 31, 1930. After leaving Nacogdoches, she moved to Galveston, Texas, lived in Seattle, Washington a number of years, and finally returned back home to La Marque to Texas roots. As a young woman, she loved sports, playing basketball and was a majorette in high school. Watching sports was one of her biggest TV past times. Her favorite teams were the Rockets, Houston Oilers/Texans and the Dallas Cowboys. In her life she was a drill team leader to an all girls drill team, band chaperone, substitute teacher, substance abuse counselor and finally settling in a career in the Nursing field; as a Nurses Assistant /Unit Clerk with a degree from the University of Houston. She loved people and taking care of others and watching General Hospital and All my Children. She was the wife of Deacon Leroy Haley who preceded her in death. She loved her family and her grand kids. Her greatest and most favorite past time was baking … she loved baking cakes and pies, most people around Galveston and La Marque/Texas City knew her not only as Mrs. Haley but also as the “pie lady” or “cake lady”. She also loved hats at one time and had hats to match every suit she owned. She was a lady. 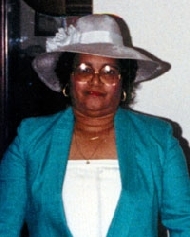 Mrs. Haley had four children, three boys and a daughter, two sons also preceded her in death…she is survived by Daughter, Charlotte Chandler who resides in Houston, Texas; Son, Donald Chandler who resides in Webster, Texas …she also has twelve plus grand children, 23 great-grand children and 4 great-great grand children and one on the way. She also leaves a host of nieces and nephews, cousins and other family members. The family will receive guests from 11-1:00 p.m. on Saturday, July 20th, 2013 at Carnes Funeral Home - Texas City with a 1:00 p.m. Funeral Service. Burial to follow at Forest Park - East.